Art is full of surprises. In October of 2018, street artist Banksy spontaneously shredded his painting, “Girl with Balloon,” only seconds after it sold for $1.4 million during an auction at Sotheby’s in London. Video of the self-destructing artwork went viral, and the stunt that left the piece in tatters caught the attention of viewers worldwide. To say this was an unusual moment in the fine art world would be an understatement, but isn’t creativity supposed to be about thinking outside of the box? The element of surprise is intriguing for almost any audience, and here in Pensacola, it seems that art turns up in the most unexpected of places. Ask anyone who has spent a day exploring Downtown Pensacola. 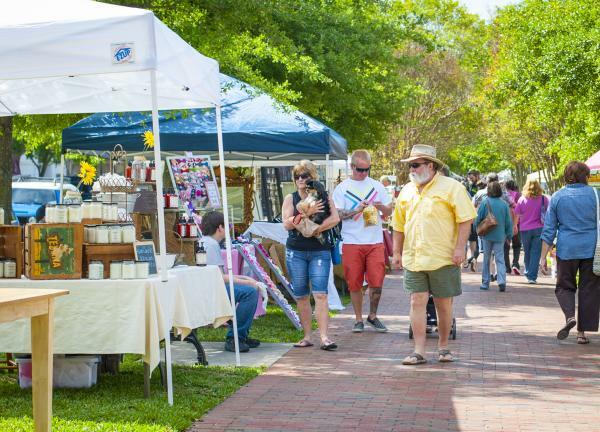 Among the farmers and bakers selling goods at Palafox Market each Saturday, talented artisans offer homemade wares including paintings and jewelry, handcrafted purses and clothing, woodworking and ceramics. Your unicorn may be waiting for you here! The market is held Saturdays from 9 a.m. to 2 p.m. at Martin Luther King Jr. Plaza on N. Palafox St. between Wright St. and Garden St.
As you stroll through the downtown area, be sure to glance at the Blue Angels mural painted on the Jefferson Street parking garage, or any of several large, 8-foot by 8-foot outdoor mural cubes. These works were created during past Foo Foo Festival events. Foo Foo showcases creative works and experiences in downtown Pensacola for 12 days each November. Other new visual art is popping up all the time. New murals have been added in the Historic Belmont-Devilliers neighborhood, as well as local businesses like Henny Penny’s Patisserie at 4412 W. Jackson St. Bring your sweet tooth because all good art goes well with cupcakes, right? At LIVE! Juice Bar & More, 532 W. Garden St., a graffiti artist created a mural memorializing the late chef and TV personality Anthony Bourdain along with a message about suicide prevention. The UWF Historic Trust has installed two murals dedicated to preserving Pensacola’s maritime history. You’ll find them on the south wall of the Museum of Commerce and the west wall of Voices of Pensacola. Right now, if you drive or walk to the end of Palafox Pier to enjoy the bayfront scenery, you might be surprised to find an 8-foot cube covered in artwork depicting some of the many experiences visitors can enjoy in Pensacola. A perfect backdrop for taking photos, the holiday-themed pop-up display will remain in Plaza de Luna through Jan. 2, 2019. 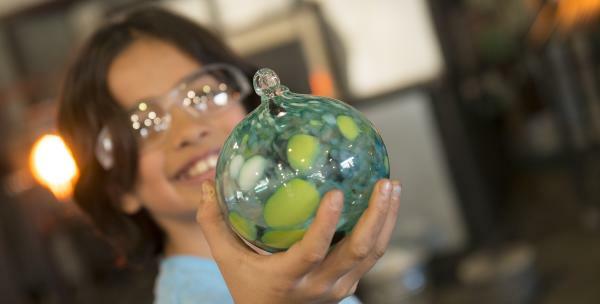 At First City Art Center, which occupies a space in the shadows of Interstate 110, artists are almost always getting their hands dirty creating everything from pottery to blown glass. Peruse the public exhibits housed at the center, or try an art class or open studio session. Or just enjoy the large mural along the inside of their building. New students, faculty, and visitors to Pensacola State College may be taken aback when they first observe famous works of art draped large across the side of some of the buildings on the Pensacola campus. PSC’s outdoor gallery made its debut with a 15-foot wide by 20-foot tall reproduction of the famous Johannes Vermeer painting, “Girl with a Pearl Earring,” which hangs from Building 14 and is visible from 9th Ave. Other works in the outdoor exhibit are Steve McCurry’s “Boy in Mid-Flight,” Gustav Klimt’s “The Kiss,” and Vincent van Gogh’s “The Starry Night.” Pensacola State College is also home to the Anna Lamar Switzer Center for Visual Arts, which features both a permanent collection of art and rotating exhibits throughout the year that is free to visitors. At Pensacola Beach, rinse the sand off of your feet and step inside the Hilton Pensacola Beach, where you may be surprised to find a permanent gallery on the second floor. 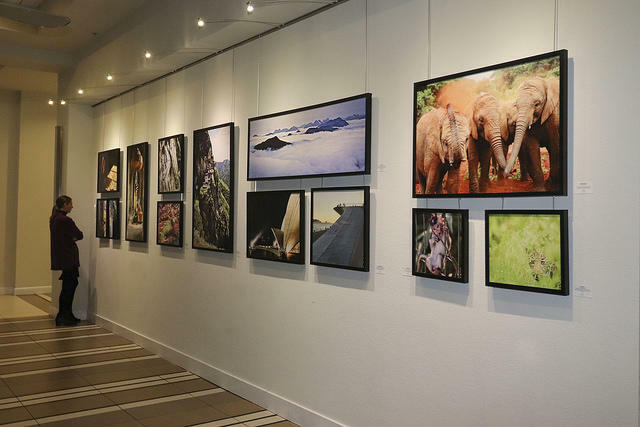 The Luna Gallery features the work of local and regional artists, all of which is available for purchase. Souvenir, anyone? So the next time you are in Pensacola, look beyond the famed Graffiti Bridge. It is one of the city’s most colorful and dynamic landmarks, yes. It’s not to be missed. But unexpected art is found all around. Observe, take photos, interact – it’s all part of the cultural experience that anyone can enjoy in Pensacola.